There are just so many Waterfords. There are just so many National Historic Landmarks. Waterford, both the tiny village itself and its rural surroundings, must be saved from the developers whose bulldozers even now are gunning their engines. Waterford is a unique, non-renewable resource - once changed, it will be lost forever. A view showing the tightly settled village and surrounding farmland. In the late 1960's, Waterford citizens and the Waterford Foundation became concerned with the danger posed to Waterford by the threat of development of the farmland around the village. Washington, D.C. was growing. The 45-mile distance was no longer an effective barrier to "progress" which translated to the subdivision of land and the building of new homes. 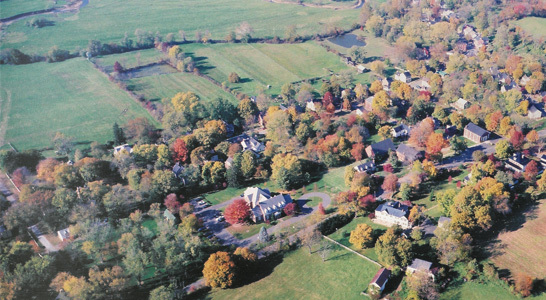 In 1970, the year of Waterford's designation as a National Historic Landmark, the Foundation committed itself to the preservation of its farmland setting as well as its buildings. Soon after, it purchased two pieces of farmland: the Schooley Mill Barn complex and pasture land and the Water Street Meadow. During the 1980's, the real estate development world finally "discovered" Waterford. Development pressures became so great that the National Park Service, in charge of the National Historic Landmark program, included Waterford as an endangered Landmark in the annual report to Congress of threatened and damaged National Historic Landmarks. Waterford has an extraordinary balance between the buildings and structures of the village and the absolutely unspoiled agricultural setting that surround it. As a National Historic Landmark, Waterford is one of only 2,000 historic resources in the United States which have achieved Landmark designation. The Landmark status is reserved for only those historic resources that have a high degree of integrity, that is, they have retained an exceptional amount of their historic form and materials, and that possess exceptional significance in the history of the nation. "Topography: Because of its unspoiled character Waterford's topography - the relationship between man and land - is easily read. The steep hills influenced the placement of roads and buildings. The rolling swales and flat flood plain of the Catoctin Creek and its tributaries contributed to the character of the fields as well as the placement of buildings and agricultural and industrial uses of land. The agricultural land is composed of historically important fields, farms, mills, and related structures. Other resources define Waterford's topography and tie together town and field: archaeological resources, ruins, fences, hedgerows, trees, and roads. Integrity: The significance of Waterford also lies in its "pristine" character. No modern intrusions mar the dense grouping of housing and structures or spoil the rural agricultural setting. Thus, the town maintains "hard edges between village and outlying open space of agricultural land." An ongoing debate within the planning and preservation communities revolves around whether new development can be integrated within historic communities. On one hand, a community by definition grows and changes, and to arbitrarily stop that change is superficial On the other hand, altering the buildings and landscape of a community removes the - opportunity to directly experience history. Waterford is a unique, non-renewable resource - once changed, it will be lost forever. The village has survived from the early 1900's to the present day with very little alteration of its basic pattern and character. It is a life-size history book, providing visitors with a glimpse into the lives of Virginians 100 to 200 years ago. To lose this living history book is to lose a vision of the past. However, the preservation challenge is a difficult one. Waterford is not a museum, it is a living and growing community filled with private residences, privately-owned land, working farms, and small, local businesses. Therefore, an approach providing for sensitively-sited and limited numbers of new residential developments within the Landmark has been chosen to attempt to meet all of the challenges facing the preservation o this unique community. The question facing Waterford at this time is "How can a group of volunteer advocates work towards the preservation of a townscape, a landscape, and a way of life? Traditionally, the Waterford Foundation has protected the buildings within the village through out-right purchase, donations, conservation easements, and a county historic district ordinance. These efforts have retained modest dwellings and prevented them from being recreated into mansions. The result is that the architectural integrity, scale and the sense of balance essential to the original founders has been maintained. 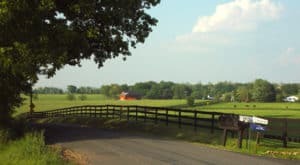 In addition, easements have been acquired on a number of parcels of land within the village and along the entrance corridor from Route 9, preserving the open spaces essential to the village's character. Funding these restorations and purchases has traditionally come from the proceeds of the annual "Homes Tour and Crafts Exhibit," a three-day fair which is held within the village. Significant assistance has also come through grants from charitable organizations and state and federal governments. Unfortunately, with the growing threat of development, these funding sources are no longer adequate to make outright purchases of the endangered buildings and their lands. The public or institutional ownership resulting from outright purchases also has the effect of diminishing the working character of the community, leading to a museum atmosphere rather than a living community. The majority of the land area surrounding the village is presently privately owned and functioning as working farms. It is this living landscape that is so important to the character of Waterford. As the economic climate for farming worsens, more and more of the landowners are leaving their land. In addition, as development continues to spread outward from Washington, land prices are spiraling upward. While a few key parcels both inside and outside the Landmark that are critical to its integrity have been saved by individual owners and/or the Foundation, landowner and preservation interests do not always coincide. Private, voluntary actions continue and are vital to the preservation of the Landmark, however the coordinated strategy of the Compact is needed to preserve the quality of the Landmark for future generations.